I hate to admit this because I feel like it lowers my cocktail street cred, but I don't generally enjoy "brown" drinks–I just can't handle the more serious burn of scotchs and whiskeys. That said, there are few things more wonderful than doing something for others, and the man I love loves a perfectly crafted Manhattan. In the spirit of generous cocktail shaking, here's a libation for the brown drinker in your life–and if that person is you, brava! Combine rye, vermouth and bitters in a glass with ice; stir for 10-15 seconds. Strain into a chilled cocktail glass, then garnish with a cherry. Notes: If you find your cabinet lacking a rye, John adores Rittenhouse 100-proof (there's also an 80-proof, for a more relaxed evening). Sazerac Rye is a bit less spicy, so it's perfect if you're still familiarizing yourself with rye. You can also try this cocktail with bourbon if that's your brown booze of choice, or simply what you have on hand. Most Manhattans include a super sweet Maraschino cherry; try steeping a few in maraschino liquor like Luxardo instead for a traditional perspective on the boozed-up stone fruit! PS-I can't tell you how delightful it was to meet Jacin of Lovely Little Details, Allison of Engaged & Inspired, Bustle's Erin and guests of honor Steph and Robin of BubbleRock, honeymooning here on the West Coast, last night for supper and champagne cocktails. Thank you all for such a divine evening! this is one of my all time fave drinks... such a classic!!! have a lovely weekend my dear! What a fabulous blogger meet up! Sounds like a creatively beautiful evening. I may have to try this one out on my husband, he would love it. Hope you ladies had fun!! Boy do I need this... I need friends, food and one of this pronto. i've never been a fan of the Manhattan, but I can appreciate this well crafted drink from afar. I love going to fancy bars and ordering this. But it seems like it would be fun to stay in, wear heels and pearls and sip these all night! Have a great weekend! definitely a classic, lena. I like how you think! I must say, I am with you. Brown cocktails don't float my boat but I am tempted to try a Manhattan as it seems like such a classic option. Pepe would drink Manhattans when I was a girl. He made them without the dry vermouth. I remember them being delicious. He would let me wet my lip on the glass and each the cherry that had been soaked in the rye. Then beddie bye. that was eat the cherry! Apparently someone has been eating the boozy cherries this Friday afternoon. World, meet my wonderful and always hysterical mama, Sue! Have a great weekend so glad you got to meet Steph & Robyn! Sounds yummy. I wish I lived in a more blogger-populated area, I'd love to meet up with someone! I think you two should open a bar. Yummy, this is my favorite cocktail! this is a test to make sure i read the whole post ;) just kidding hehe - so happy to meet you!!! Teehee! You sound just like me. I'm not a huge fan of "brown drinks" either!! 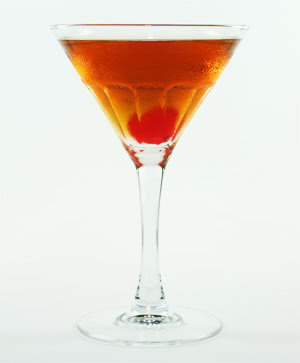 I'm with you...but I'd be willing to give the Manhattan another try, simply because it looks so incredibly classy!